Wedding PR: Honeybook, The Perfect Palette, and More! We are so excited for this week’s client features, including Honeybook, The Perfect Palette, and so much more! See it all below. Magdalene Photography was featured on ISO ALT for their feature, Edgy Alternative Styled Wedding Portraits in Milwaukee. See the full feature here. 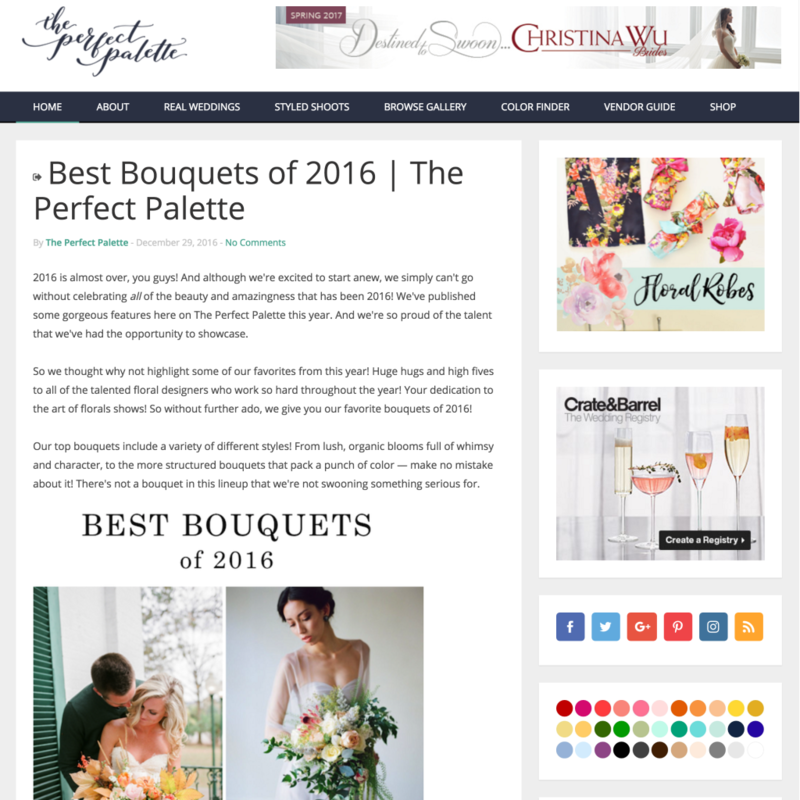 Kaysha Weiner Photography was featured on The Perfect Palette for her article, Best Bouquets of 2016. See the full article here. Mike B Photography was featured on Brides for his article, The Most Common Mistakes Couples Make When It Comes to First Look Photos. See the full article here. Belladeux Event Designs was featured on Honeybook for her article, How to Stay Up-To-Date with Trends. See the full article here. Cocoon Events Management Group was featured on Honeybook for their article, Unique Ways to Find Inspiration. See the full article here. Belladeux Event Designs was featured on The Bridechilla Podcast with her episode, Get Creative With Experiential Weddings. Listen to the full episode here. Belladeux Event Designs was featured on NOLA.com with her article, An Elizabethan Evening Honoring Elizabeth French and Elizabeth Redd. See the full article here. Cocoon Events Management Group was featured on ThinkShaadi with their feature, Louisa & Teo: A Glamourous Arabian Nights Fairytale Wedding In Morocco. See the full feature here.